Soldat is a free 2D multiplayer shooter, which was released in 2002. It has since then become a milestone, both for gamers and the press. Soldat is still under active development and was just recently updated to support 4KHD graphics. tons of servers and players waiting for you to join the battle! You can play Soldat for free! Get the latest version here. 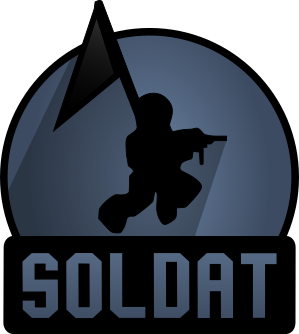 Soldat has an active multiplayer community with around 200 active players on our gather and a few more hundreds in the public servers. Play tons of different game modes with players from the whole world. Soldat's multiplayer client and server are both lightweight programs, which both run smooth on low end machines and ensure you a decent latency even if you're on a slow connection. Soldat is despite the thoughts of some people not a 'small web game', which might entertain you for a few hours only. As proven by thousands of players, Soldat is a game which will keep you hooked for years or decades because of it's unique and competitive game style. 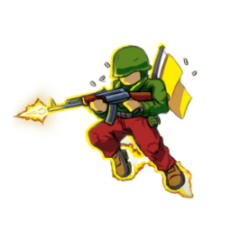 #Soldat Gather is the home of the competitive community for the free 2D multiplayer game Soldat. Play organized Soldat mutliplayer matches in several gamemodes on soldat servers located all across the world. Read more about our gather and how it works here. © 2010 -2019 #Soldat - All rights reserved.